According to the Centers for Disease Control and Prevention, an estimated 52.5 million adults in the United States were told between 2010 to 2012 they have some form of arthritis. Many over-the-counter medications or prescription drugs for arthritis pain relief have negative side effects. As a result, some people turn to natural remedies like essential oils. Essential oils are used to treat arthritis pain two ways: external application or inhalation. Many oils are used topically or inhaled to help ease arthritis pain. According to Julie Chen, M.D. in an Arthritis Today article, some scents activate a reaction in the nervous system, which stimulates the release of dopamine. Dopamine is a neurotransmitter associated with your brain's pleasure center. Some aromatherapy oils that may help relieve arthritis pain follow. According to alternative medicine expert, Dr. Josh Axe, bergamot oil increases hormone secretions, which reduces the sensitivity of pain conducting nerves. A study published in Frontiers in Pharmacology concluded bergamot oil used in aromatherapy has painkilling effects. Study results suggest bergamot oil may also relieve the stress and anxiety that is often associated with chronic pain. Lavender has a reputation for being relaxing and calming the nervous system. According to a study published in Evidence-Based Alternative and Complementary Medicine, lavender aromatherapy helps reduce pain and pain intensity. Lavender oil may also be applied topically to painful joints. Research published in BioMed Research International found aromatherapy using a combination of bergamot and lavender oils helped manage chronic pain in older people, as well as its associated depression and anxiety. Many people with arthritis pain have trouble sleeping. Lavender oil is known for promoting relaxation and restful sleep. According to the National Sleep Foundation, studies show inhaling lavender oil decreases heart rate and blood pressure and encourages deep sleep. Ginger essential oil causes a warming sensation when applied to the skin. It's thought to increase circulation and help relieve pain. A study published in the Journal of the Medical Association of Thailand showed people with knee osteoarthritis experienced improvement in knee pain, symptoms, daily activities, sports activities, and quality of life when ginger extract in carrier oil was rubbed into their arthritic knees for 12 weeks. A separate study published in Complementary Therapies in Medicine suggests aromatherapy massage with a blend of ginger and orange oils may offer short-term relief of moderate to severe knee pain in elderly people with osteoarthritis. Turmeric contains high levels of curcumin, which is a compound that not only gives turmeric its golden color, it's also responsible for its anti-inflammatory benefits. According to a study published in Drug Design, Development and Therapy, curcumin extract helped reduce pain and increased physical function and quality of life in people with osteoarthritis. Known for being the exotic spices the Magi brought to the baby Jesus, frankincense and myrrh are highly valued in herbal medicine. Both plants have anti-inflammatory abilities on their own, but they may be most effective together. According to a Daily Mail article, research shows applying frankincense and myrrh oils together may relieve arthritis inflammation and pain as well as conventional painkillers like ibuprofen. Essential oils should always be combined with a carrier oil to reduce your risk of skin irritation. Some carrier oils are coconut oil, olive oil, jojoba oil, sweet almond oil, and grapeseed oil. Massage oil: Combine 15 to 20 drops essential oil to one ounce of a carrier oil; massage into painful, inflamed joints as needed. Lotions and creams: Add 3 to 6 drops of essential oil to one ounce of your favorite unscented lotion or cream; dab onto your skin to enjoy aromatherapy benefits. Aromatherapy bath: Combine up to 12 drops of essential oil with a teaspoon of honey, whole milk, or carrier oil; add to your bath and soak at least 10 minutes. Steam inhalation: Add several drops of essential oil to a pot of boiling water; with your eyes closed, cover your head with a towel and inhale steam through your nose. Direction inhalation: Inhale essential oils from their bottle or add a few drops to a cotton ball, inhaler tube, or handkerchief and inhale a few times daily. Most essential oils are generally considered safe when used diluted on the skin. All essential oils may cause severe skin irritation, especially undiluted. Bergamot oil may make you more sensitive to sunlight and increase your risk of sunburn or skin blisters. According to WebMD, lavender oil should not be used in boys who have not reached puberty. The oil may disrupt hormones and cause abnormal breast growth. Since lavender oil has a sedative effect, don't use with medications or other herbs that cause sleepiness or relaxation, such as barbiturates and some antidepressants. There's not much research on the impact of aromatherapy or the topical use of essential oils in pregnant and breastfeeding women. If you're pregnant or breastfeeding, don't use essential oils unless under the guidance of a doctor or trained aromatherapist. Make sure the oil is 100 percent pure and lists the botanical (Latin) name on the label. Avoid oils labeled as "fragrance oil," or that list fragrance as an ingredient. 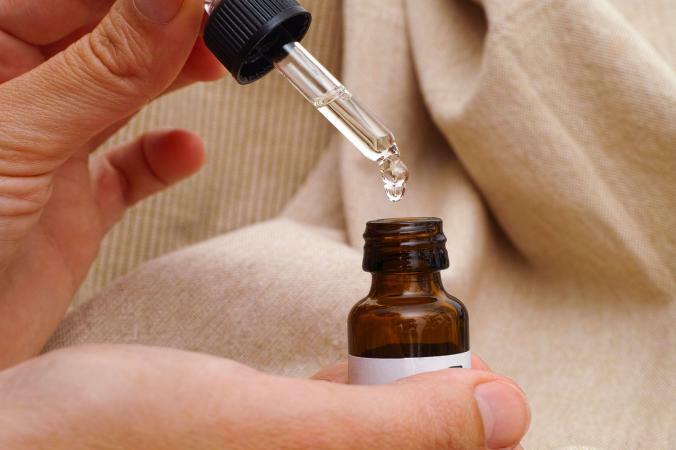 Essential oils with a very cheap price tag are unlikely to be pure. Only purchase oils in amber or blue glass bottles, never plastic bottles. Remember, essential oils are potent. A little goes a long way. When in doubt about dosage, consult a trained aromatherapist for guidance. However, when used properly, certain essential oils may help minimize the pain associated with arthritis.